Milissa Esposito-DeFusco’s Art starts out as “something old,” but as she works with it, it becomes “something new.” By reusing, recycling and restyling everyday items, Milissa creates something beautiful, unique and exciting. Her work incorporates many vintage and forgotten pieces like old buttons, carpenter’s nails, jewelry findings, trims, fabrics and lace. 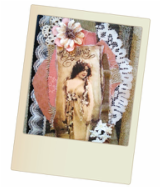 She sells these decorative items at her shop, A Bee’s Buzz, in Foster, Rhode Island where she displays a large collection of old journals, photo albums, hanging artwork, wearable fabric collages and a wide range of seasonal merchandise. An Interior Designer by trade, Milissa uses her education and intuitive knowledge to help her clients create their own settings and environments. Milissas’s fondness for what she calls “the old world flair” is seen throughout her store in her one-of-a-kind artwork creations extracted from many different eras and places. In addition to creating her own special kind of art, Milissa also sponsors several non-profit organizations such as Breast Cancer Awareness, Autism Awareness, The MS Foundation, and The Tomorrow Fund, by donating her creations for raffles and silent auctions. You can find Milissa’s creations at https://www.etsy.com/shop/whimsicalndelightful.